Graceful Geometry in Thai Art. From point to line to plane. The West has taken these three basic Euclidean ideas for granted as reality. 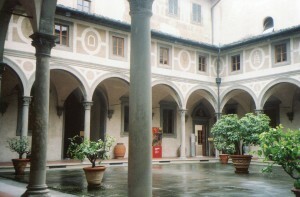 Architects in Florence in the 15th century reinforced these assumptions by putting the most perfect expressions of lines and shapes into architecture. They did this as Florentine painters were developing three-dimensional perspective. Western assumptions that static and linear geometric shapes are basic reality emerged in many dimensions. 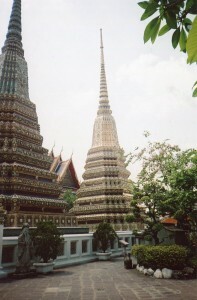 But in Thailand at the same time, different concepts of geometry became dominant ideas that society organized its thought around. Come and explore a different view of reality with me. The stupa is one of the most revered Thai art forms. It originated in India, and it was a burial mound in ancient times. 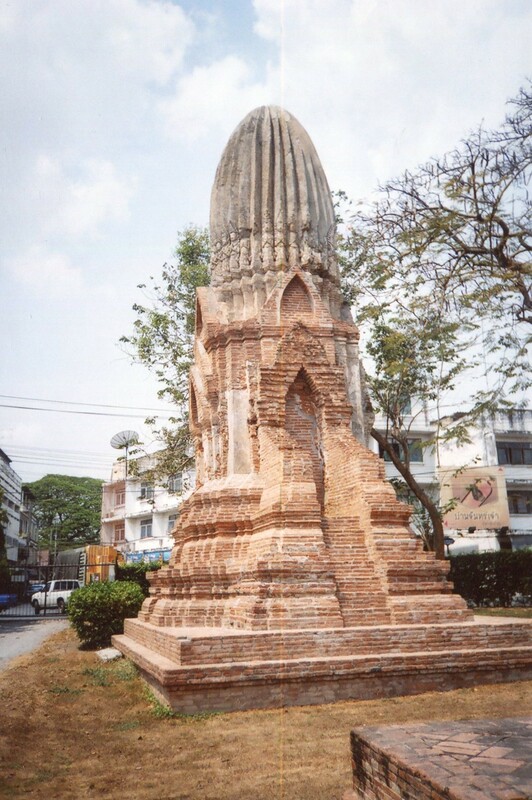 When Buddhism emerged, it was associated with the great teacher, and was used to house relics. 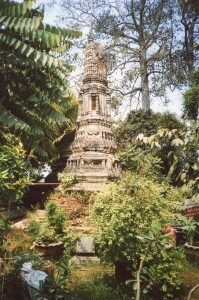 Thais adapted a stupa form from Sri Lanka with three levels. They represented the three levels in Buddhist cosmology. The bottom was an inverted half sphere, like a cereal bowl turned over. The middle was a square. The top was a bell shape that ended in a conical spire. Thais took this form and added magic. They elongated the form, and blended the three sections so they form a continuous line that undulates as gracefully as a river’s flow. You can see these sinuous lines in many arts, including painting, dance, temple architecture and domestic architecture. Thais also indented the corners. They did this in an endless variety of ways. The above stupa in Lopburi is just one example. In thousands of variations, the combination of indentations and increasing narrowness towards the top makes the whole building ripple as delicately as a stream. Water has always been prominent in Thai art. 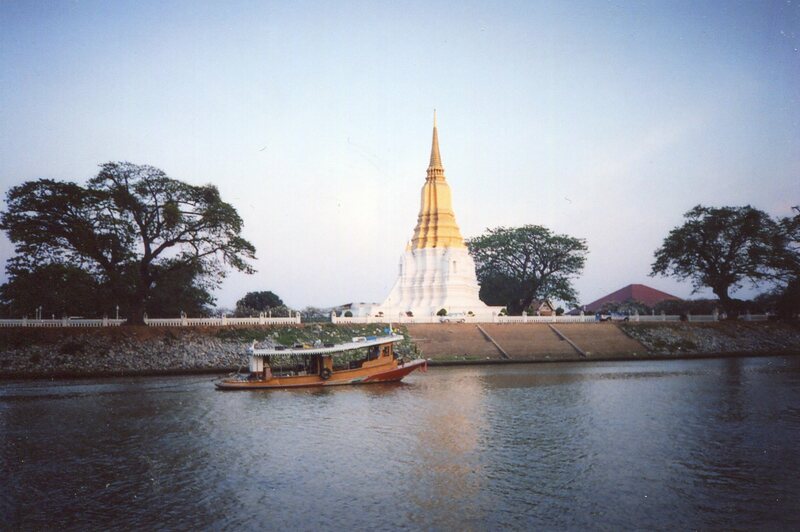 Many people lived in villages by rivers before Bangkok became the concrete dragon. Folks used little boats as their main vehicles for getting around. Stupas were often built near them, and their delicate lines are reflected in the limpid ribbons that gracefully flow by them. Put all these ideas together, and you have a very beautiful way of seeing reality. Things aren’t shoehorned into an abstract grid. They assume millions of delicate forms, and blend in limitless ways. 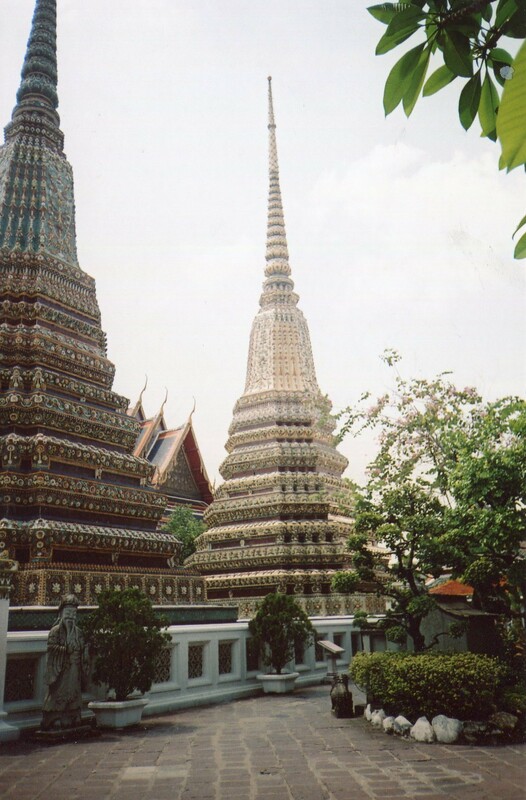 Thai society has generally been known for tolerance of diverse people, gentle manners, and love of fun. When the Thai states were growing, they sponsored temples, paintings, dance performances and processions with these flowing, undulating lines. They became models for the way reality is unified–the pattern that connects, in Gregory Bateson’s words. They might not let you analyze things as precisely as the three-dimensional perspective that emerged in the West does. But they allow an infinite variety of forms and perspectives to coexist and be enjoyed–and they allow a whole lot of fun.